For the past two years we have been working with communities in Fishermead, Milton Keynes on a project called Media4ME. It’s part of a six-nation EU programme co-ordinated by our partners Mira Media in the Netherlands and David Wilcox of Socialreporters has also been working on the project with us. We have a presentation about the Media4ME project here. And we have written a more detailed report here. The project has used an asset-based approach to community empowerment, seeking out individuals with their own ideas and plans, and using the project resources to help them. We have also put concerted effort into connecting up those individuals so they can make a bigger difference. But rather than try convincing people to take up this offer we looked for someone who wanted to make a radio programme. Admittedly we could have ended up looking for a long time, but in fact we soon came across a manager in the council’s education department. He was part of the Ethnic Minority Achievement and Support Service and his role is to make links between the mainstream state schools in Milton Keynes and supplementary schools – that is, the Polish language schools, Islamic classes, West African schools and other evening and weekend schools which local children attend outside of formal school. When we told him about the Media4ME project he put tow and tow together and asked if we could help him make a radio programme about his work… so we agreed. To begin with we were planning a very conventional radio interview, recorded in the studio. 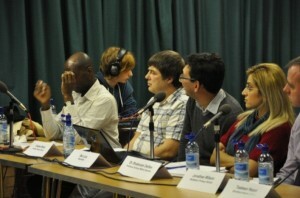 But following several meetings with the radio station founder a more creative idea took shape… and in October 2012 this is what we ended up with three radio panel discussions recorded in front of a live audience of local residents in the community centre. Half the panel are teachers in mainstream schools, and the other half are teachers from supplementary schools (a Polish teacher, a Islamic Madrassa teacher, and the head of a Yoruba language school). They answer questions about how they perceive each other’s schools, and answer questions form the audience. At the end of the first programme, they had all learned a huge amount about each other which they did not know before. In fact one of the mainstream schools has now invited the supplementary schools to come and meet their staff so they can build stronger relationships. For the final radio programme in December it was not just a radio show we helped make. We also supported the production of a short film about the radio shows, made by three students who attended the first programme recording. They are all media studies students, and they have become excited by the idea of learning new media skills through their involvement with the project.